I rarely tell you ladies that you need a certain item I feature on my blog. I try to write from a perspective that we're all friends here, and I'm simply sharing little pieces of myself with you. I've never been much of a salesperson - I don't feel comfortable pushing products, and I don't want you here just for clicks and commission. Don't get me wrong, I'm always grateful when you like something enough to buy it for yourself, but in the great scheme of things, I don't rely on this blog for money or I would have stepped it up ages ago. 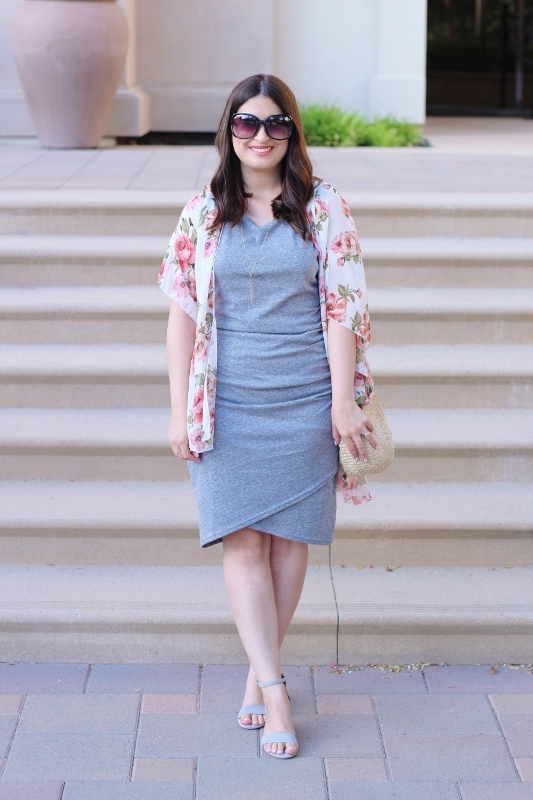 My hope has always been that an outfit I style will inspire you in your own wardrobe. However, with all that being said - everyone needs this dress! This ruched body-con dress comes in multiple colors, but I chose to go with a neutral. It's made from a stretchy cotton/poly blend, so it's incredibly soft and comfortable. The ruching at one side conceals a not-so-flat tummy while still showcasing your curves. I used to be so self-conscious of my hips and thighs that even the thought of a body-con dress made me cringe. I still prefer looser fit and flare styles, but this dress has made me appreciate my curves in a way I never have before. It's okay to own it! I truly think our bodies are amazing, and there's no reason to ever be ashamed of them! 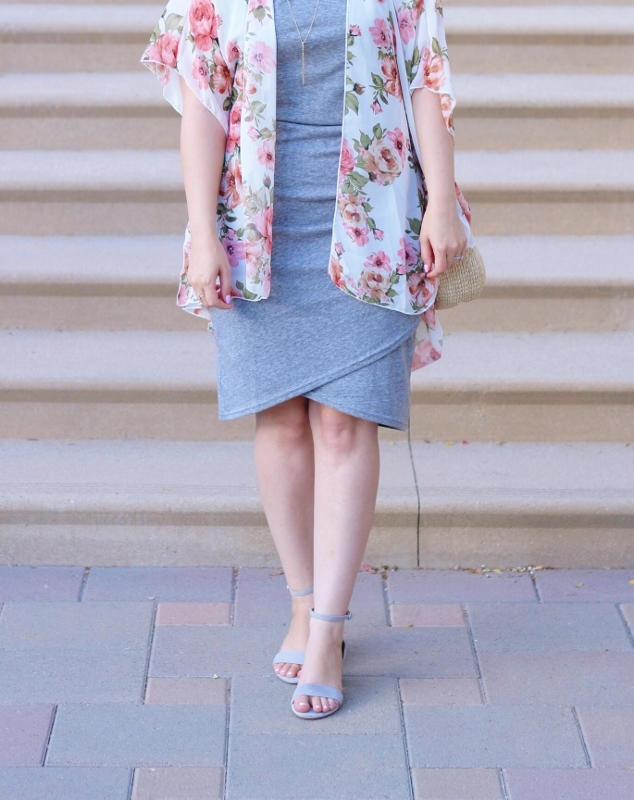 I added this gorgeous ivory floral kimono for a light layer, but how cute will this dress be later in the year with a longer cardigan? I can't wait to style it in cooler weather. This outfit was taken last week before Nate and I went to a "speak easy" in Old Town. It was such a cool experience! I'm fascinated by the prohibition era. My great grandmother was a flapper (seriously) and I like to imagine myself dancing to Cole Porter or Louis Armstrong. I think I would have fit right in! Linking up with On The Daily Express, Straight A Style, and Pumps & Pushups. Such a fun outfit and I have like 5 dresses in that style. That's such a fun activity, I would have enjoyed that. I think you need to release your inner dancer a little more often, Noelle! :) I can definitely picture you in clothes from that era. As for this era, it's so fun to see you in this style of dress! Definitely a change for you and it looks GREAT!! OMG! I love this dress on you Noelle! The Kimono adds a nice touch of color... so cute! That dress is lovely on you! 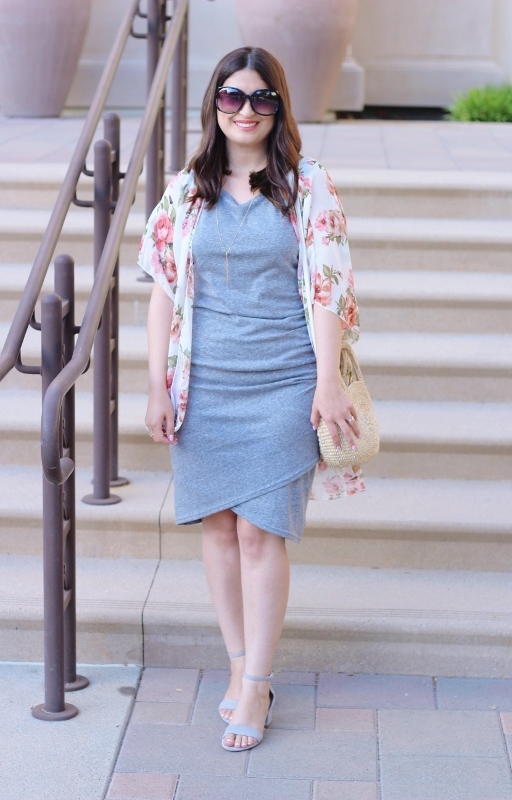 The tulip hem is my favorite part, and the kimono is a fun way to add print to the look. I'm with you, I blog and read blogs for inspiration more than to shop, though shopping inevitably happens!